Let’s face it humble budget acoustic guitars are usually where most of us start off when we take up the instrument. The fact that you can take it out of the box and give it a strum without having to worry about amps and leads is a major attraction. However, choosing the wrong acoustic can end your interest in the guitar before you’ve even got warmed up. So choosing the right acoustic guitar is critical especially if you are buying for someone else. I can give you an example from my own experience which hopefully will help to illustrate why making the wrong choice when choosing from the vast range of budget acoustic guitars is a bad thing. When I first decided that the guitar was for me I was a young, but not so fresh faced, teenager with very little money to spend. As is often the case with the keenness of youth I didn’t want to wait and save for a guitar I wanted one there and then. So with little more than £20 I headed to my local Argos, I know not a well known guitar retailer, and purchased the cheapest acoustic they had to offer as that was all I could afford. I rushed home with a keen sense of anticipation at the musical treats that would soon be ringing from my new guitar. Sadly this was not to be the case. The guitar I had purchased was, unfortunately for me, an absolute nightmare. The build quality was poor and the sound, when I managed to hold a note down, was pretty dire. Even though I was a novice, and my fingers needed conditioning to holding strings down onto the fretboard, I would have needed the finger strength of Arnold Schwarzenegger the action was so high. Finally the thing wouldn’t stay in tune long enough for me to try and play anything. Mind you not that I could with the blisters I had from trying to hold the strings down. It was truly an awful guitar and I would suggest that if a friend hadn’t given me a loan of one of their electric guitars my foray into what should have been an exciting new hobby would have been brief indeed. So what is the moral of my little story? Getting the right acoustic guitar is exceedingly important if you are going to enjoy the playing experience and stick with learning how to play. Incidentally choosing whether it is an electric or an acoustic guitar that you choose to play is critical and we have written a handy article to help you choose called which is the best to learn on electric or acoustic that is well worth a read. If acoustic is for you then we have therefore put together a list of some of the better budget acoustic guitars that you can pick up. We have broken our list down into acoustic guitars for under £100 and acoustic guitars for between £100 and less than £200. Budget Acoustic Guitars for under £100. The Martin Smith W-100 is cheap but is it a good guitar? The Martin Smith W-100 acoustic guitar at a shade over £40 is the cheapest guitar on our list of budget acoustic guitars but does it mean you get a rubbish instrument? The guitar body is constructed from Agathis and has a nice looking spruce top with an attractive looking natural finish. The neck is maple with a rosewood fingerboard and 22 frets. The neck is comfortable to play but, because there is no cut-away, it is difficult to access the upper frets. The guitar sounds pretty good when played with a reasonably warm mellow sound rather than a cheap tinny sound that you can get from a cheap guitar. The build quality of the guitar is good if not amazing but then you are only paying a little over £40 so that should be expected. Generally the Martin Smith W-100 is a good budget acoustic guitar as long as you take into account the fact that you are not paying a lot of money for it. We would view this as a guitar you buy if you are unsure if you are going to stick with playing the guitar. If you don’t stick with it you haven’t spent a lot of money but if you do then you can always up-grade to a more expensive model at a later date. 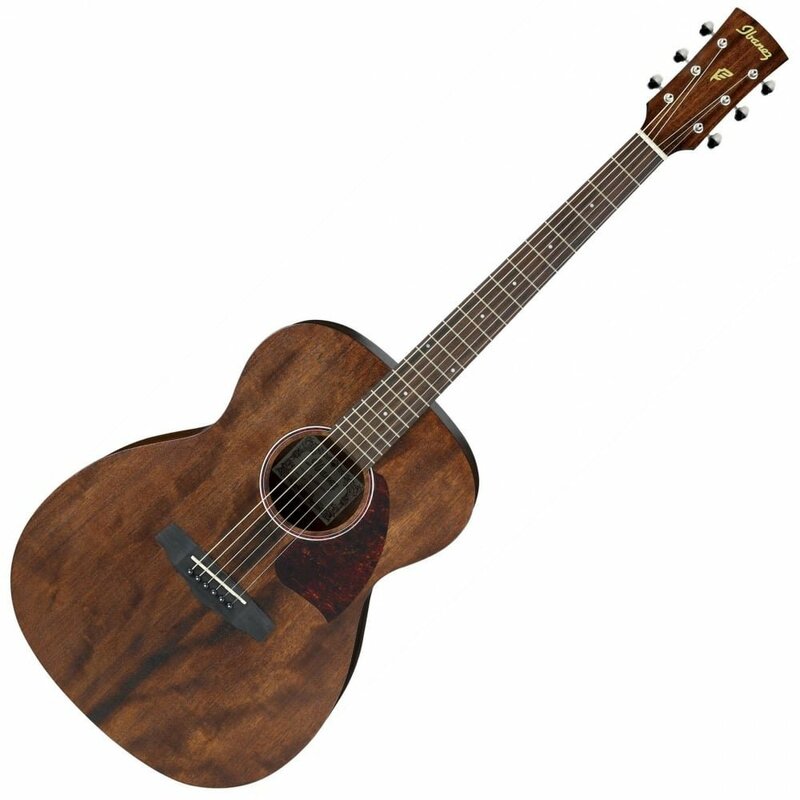 With a great cut-away the Ts-ideen is an extremely playable budget acoustic guitar. 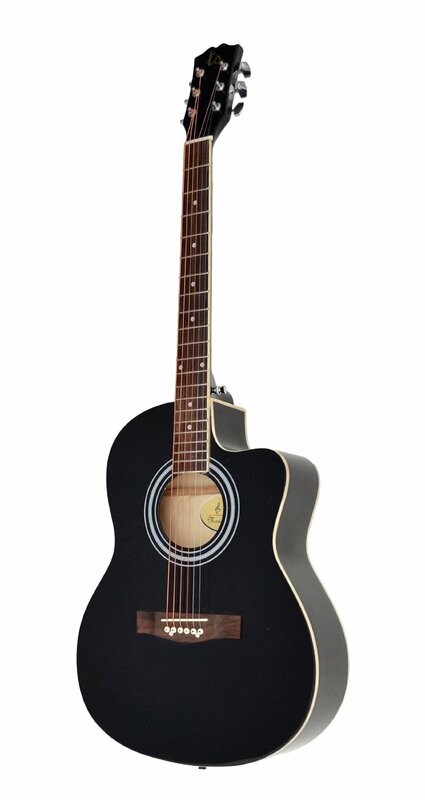 The Ts-ideen 5269 4/4 acoustic guitar is one of the cheapest guitars on our list of great budget acoustic guitars. Made from linden wood with a birch neck and rosewood fretboard this is a great value guitar. The guitar has a comfortable feel, plays well and sounds ok considering the price. The Venetian cutaway allows easy access to the upper frets, which is a nice touch, and makes it easier for a novice to gain a feel for using the full length of the neck. I would have to say that the main criteria for selecting an acoustic guitar, at least as far as I am concerned, is that it has to be easy to play and it has to stay in tune. The Ts-ideen gets a tick in the box for both criteria which is always a good sign. The only issue as far as we are concerned is that it is a bit light-weight and the construction is relatively basic which may mean that it suffers if it receives any abuse. Therefore the life-span of this acoustic guitar might not be that long, but it is likely that as you improve you may look to up-grade to a more expensive model. But taking everything into consideration and the price point of the instrument, just over £40, I think you would be hard pressed to find a better guitar. The Lindo 933C has a very modern contemporary look to it suggesting that it is aimed at the rock end of the market. Our next guitar is a little bit more expensive but still represents excellent value for money. Lindo are a great guitar company who have the stated aim of making exciting guitars at amazing prices and generally they do a cracking job. This is certainly the case for the Lindo 933C Apprentice series acoustic guitar. The Lindo 933C is a good looking acoustic guitar. It comes in a number of shades which should appeal to just about any taste. Made from Linden wood and with a slim feel catalpa neck topped with a rosewood fretboard this guitar certainly has a more modern feel to it than a lot of acoustic guitars. The guitar has a nice venetian cut-away which allows easy access to the upper frets. This combined with a nice low action and the Fender style headstock suggests that this acoustic is aimed at the rock end of the guitar market. There really is not much that we can fault on this guitar, if you like your acoustic to have a modern look and feel then this really is for you. 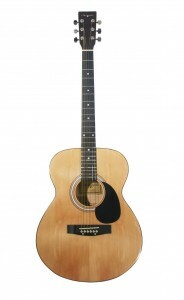 Factor in the price and the fantastic Lindo customer service we think this is a great starter budget acoustic guitar. The Ibanez V50NJP-NT is another great value acoustic from a company thatgoes the extra mile to produce quality instruments. Ibanez are a well known and well respected guitar company although perhaps better known for their electric guitars. However, they do produce a good range of acoustic guitars and the Ibanez V50NJP-NT is from their budget range of acoustics. This is a no frills entry level guitar which really plays well and sounds good. Although made from cheaper woods the guitar is well put together and the neck plays well with a nice low action. Unlike the Lindo or the Ts-ideen the Ibanez does not have a cut-away which restricts access to the upper frets but that aside this is a good acoustic guitar for the money. 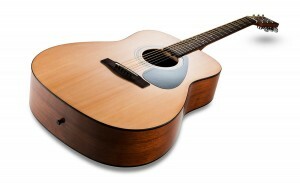 Is the Epiphone DR-100 Dreadnaught the perfect budget acoustic guitar? Our next guitar just squeaks in under the £100 limit. 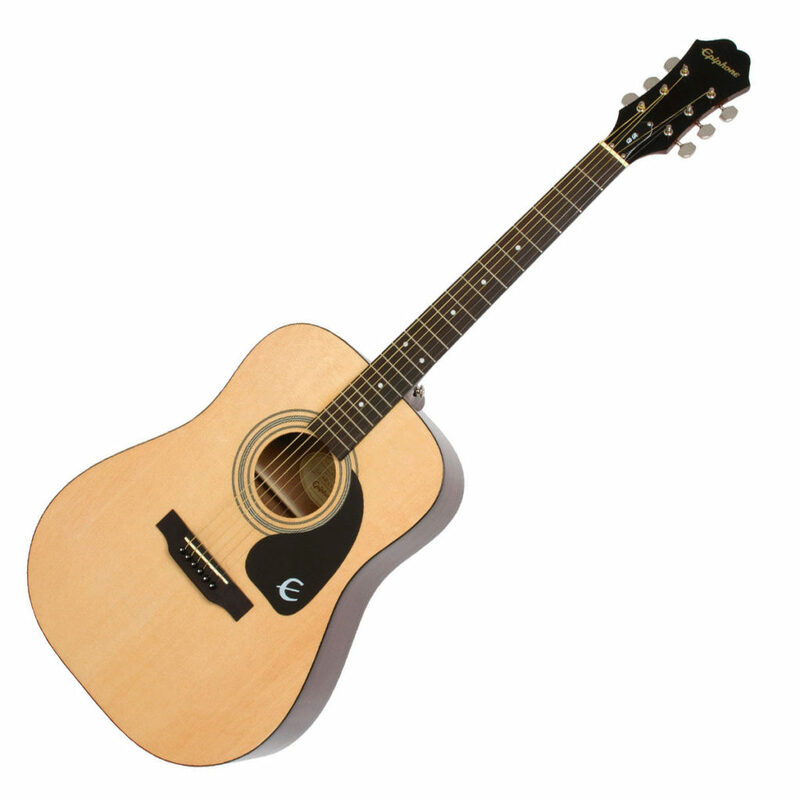 The Epiphone DR 100 Dreadnought is a classy acoustic which as the name suggests a solid and reliable acoustic. We don’t quite know how they have managed to build this guitar for under a £100 because everything in the specification is top quality. The back and sides of the body are made from Mahogany and the top is spruce. The combination of these two woods gives a guitar which has beautiful tone and strong resonance and sustain. The neck is mahogany and this is topped off with a 20 fret rosewood fretboard. The neck has a slim taper profile which is comfortable to play. Combine this with the low action and you have a guitar which is ideal for the novice whose hands will need a bit of conditioning. As we said above the choice of tone woods means that the Epiphone DR 100 Dreadnought has a beautiful tone. Rich, mellow and resonant you would be hard pressed to beat the sound quality of this guitar at this price range. You can read our full view of the Epiphone DR 100 Dreadnought here. It is certainly true that if you are willing to pay a little bit more money then you will get a better guitar. This is especially true for budget acoustic guitars. The main difference when considering budget acoustic guitars is that the tone woods used will generally be of a higher quality giving a guitar with a better sound. So if you have the budget it is worth considering the guitars below. The Yamaha F310 is a guitar that is well put together, as you would expect from a company like Yamaha, and has all the looks of a more expensive instrument when you consider the price. 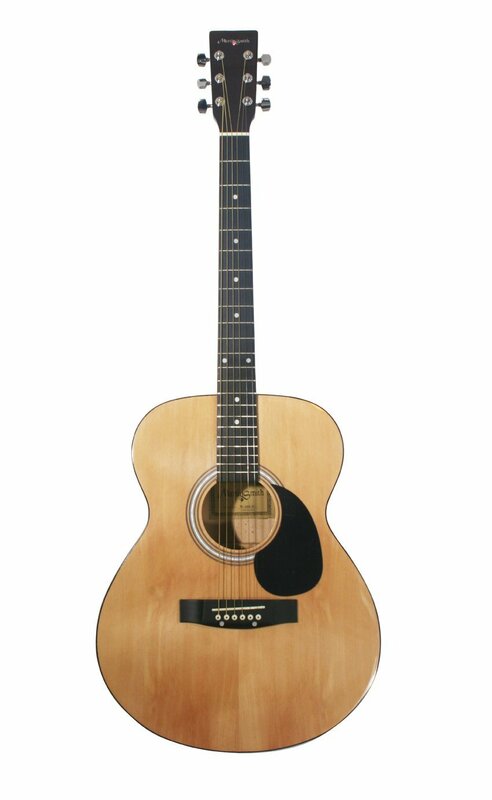 The body of the F310 is made from Meranti, a cost effective guitar wood often used in budget acoustics. The top is cut from a nice piece of spruce finished with a nice natural look that really sets off the instrument. Spruce is a good tone wood in acoustic guitars and the choice of spruce as the top for the F310 means that it has far better tonal qualities. The Yamaha F310 is the most expensive guitar on our list but is still fantastic value for a great guitar! The neck is made from Nato and has a rosewood fingerboard with 20 frets. There is no cut-away on the F310 so there is not such an easy access to the upper frets which you get with the Lindo or Ts-ideen but this is more than compensated for by the easy play neck which has a nice low action ideal for novices. The sound produced by the guitar is really rather good and the tuning stability of the F310 is brilliant so none of the frustrating de-tuning that you get from cheaper guitars. All in all, if you can stretch your budget a little, this is a great guitar for the beginner. The Ibanez PC12MH-OPN ticks all the boxes for a great starter guitar! Next up is another Ibanez acoustic guitar. The Ibanez PC12MH-OPN does, so far as we are concerned, ticks all the right boxes. 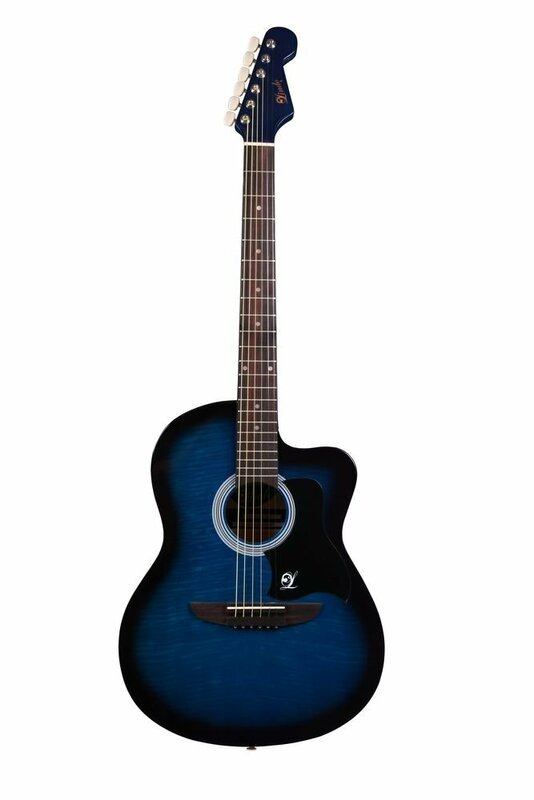 It is a beautiful guitar, it sounds amazing and it is excellent value for money. WHat more could you want. Made from African Mahogany the guitar is a Grand Concert body size, which means that it is slightly slimmer, which is ideal for beginners. The neck is mahogany topped off with a 20 fret rosewood fretboard and is a joy to play. Once again the build quality is fantastic for what is a budget acoustic guitar. In terms of sound the Ibanez PC12MH-OPN makes full use of the tonal qualities of African Mahogany. The guitar has a rich mellow sound with excellent definition and resonant sustain. This is a great guitar and well worth consideration. Read our full review of the Ibanez PC12MH-OPN. There are a lot of options available if you are looking for a budget acoustic guitar. Some instruments will be not so good but every now and again you will find a little gem which will propel you along the road to guitar mastery simply because you won’t be able to put it down. We think that the budget acoustic guitars on this list represent a great selection of some of the best available. If we were pushed to recommend one then for sheer quality at an amazing price then the Lindo gets a thumbs up from us. But if you had a bigger budget the Yamaha F310 is hard to beat. Which guitar would you choose, if you have a recommendation that does not appear on this list then let us know. If you are looking for great value electric guitar starter packs then follow the link below.